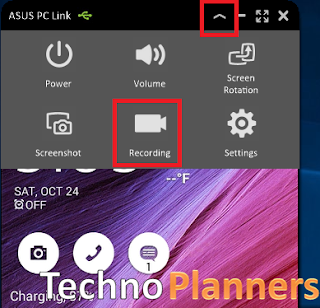 Tutorial - How to Record Screen or Display on Asus FonePad 7, MeMO Pad 7, and Fonepad 8, Zenfone 5, Zenfone 6, Zenfone Selfie, Zenfone 2, Zenfone 5 LTE, Zenfone 2 Laser, Zenfone Delux and all Zen device supported. In this method we are using PC Link to record Screen. We also attach a video Tutorial it more easy to understand to connect pc link and record display on Zenfone. PC Link (Download from End of Post). Updated Version of PC Link in both Device. Step 1. First, You have to download and install PC Link on Your PC. You can also check out How to Connect PC Link on Zenfone Device. Step 2. After Connect, At the upper right corner select first option, then click on recording button to start capturing screen. Step 3. To stop recording again go previous option then select recording. Step 4. Now it show saved file under Document directory. Congratulations, Now you can record your display without root permission. If you are running Android L 5.0 on your Zenfone. You can connect PC Link without using data cable. You can also check out How to Connect PC Link using Wifi Connection on Zenfone.